The EKFC is thrilled to announce that Nelson Alexander will again be the clubs major sponsor in 2018. We appreciate the excellent support we receive from Sam, Mark and the team at The Centreway and they are always willing to help with our functions etc. when required. The Keilor East team are specialists in Keilor East Real Estate. With varying degrees of experience led by Sam Carbone and Mark Giardina this team of real estate agents in Keilor East are well known for their charisma, energy, expertise and unwavering belief in delivering more for their clients. While their home office is Keilor East, they traverse the entire footprint of Nelson Alexander and are expert real estate agents in Keilor, Avondale Heights, Maidstone, Taylors Lakes, Sydenham, Kealba, Braybrook and surrounds. Remember to support those who support us when it comes to selling your property! A friendly reminder that our Junior Pre-Christmas Registration is being held this Sunday from 11am-1pm. We are pleased to announce our Coaching Appointments for the 2018 season have been finalised. We welcome back John Edgar and Rob Caluzzi who have coached previously, Shane Webster who returns as 11’s coach and Rod Vella, and Robbie Rutley and Aline Bonifazzi as first time EK coaches. If any players and parent have any questions etc., please do not hesitate to contact the relevant coach. 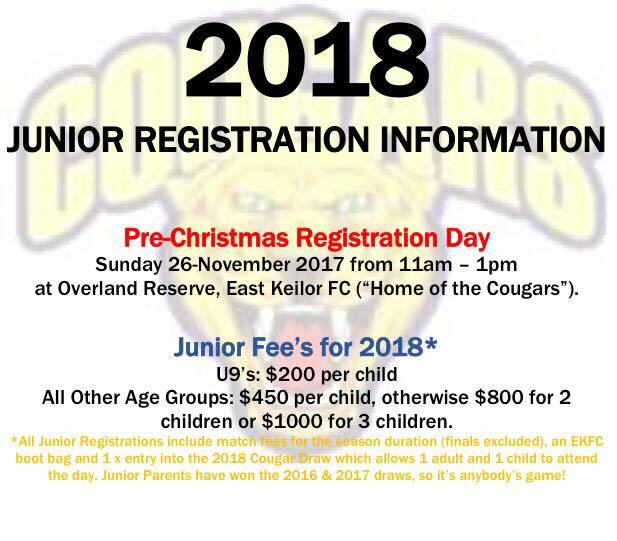 Don’t forget, our Pre-Christmas Junior Registration Day will be held on Sunday 26-November between 11.00am-1.00pm at the club. 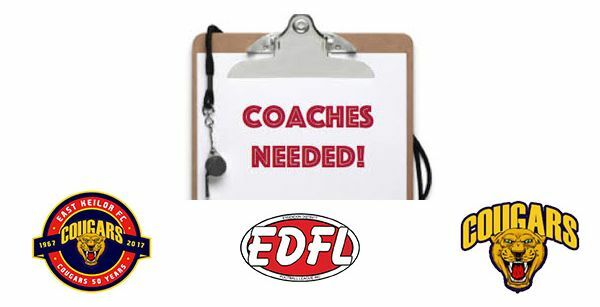 We may well be looking for additional coaches in the 9’s and 11’s once we know our final numbers, so if you have any interest please contact either Lisa Wiz on 0408 959 080 or Gavan Wignall on 0418 306 000. The EKFC is pleased to announce our new committee for 2018 following results from the AGM a few weeks ago. It is pleasing that our committee has been boosted with some quality new people which will help us streamline operations. In particular, a warm welcome to Steve Wooster, who is an associate of Andy Ruberto and is keen to help out the mighty Cougars. GIRLS – Under 11’s, Under 13’s & Under 15’s! Come along to your information night at Overlands Reserve (Parkside Ave, Keilor East) on Tuesday 14th November at 7pm! There only a few left and as per the price set at the ball these are $200. These are brand new jumpers and are the same ones the seniors wore against Westmeadows on June 17 heritage game. Please note that we have the following available. These all have the number 50 on them to represent the 50 years of the Cougars. There is also One XL jumper with number 46 on it. This is $100. Please see Gavan or John to grab one because once they are gone ………..they are gone! Please note this book is on sale at the club for $20. You can also get a copy posted for $25 or you can email ekfc50years@gmail.com. This is a brilliant production and is a comprehensive history of the club since 1967. Please note the ball is fast approaching ( JULY 29 ) and we still have 50% of people to pay for their tickets . We have the commitment from lots of the EK family but we need the money ASAP! Of all the tables booked to date, we only have one table that is completely paid for. Please organise your payment as the venue needs to be paid this week. If you have a full table booked as the table captain , please get the names and payment to us as quick as you can. Please see Gavan or John on Tuesday and Thursday night at training from 6.00 pm to pick up your tickets and help us finalise the event. There is also the option to pay on line so there is no excuse not to get this finalised. Any queries etc. , please call Gavan on 0418 306 000. As of last night, Thursday 11 May, – 24 tables have been booked so for the ball. We still have a number of open age players to organise their tables along with some of the junior teams. Our initial estimate of 300 attendees looks like being smashed, as it should be, for such a great moment in our club’s history. There is still time to organise your table so please do so by contacting either Gavan, Kylie or Lisa Wiz . For those that have booked , please start organising payments. Payments can be taken everything Thursday & Friday night or online if that suits. Don’t miss out on the biggest night in the clubs history . 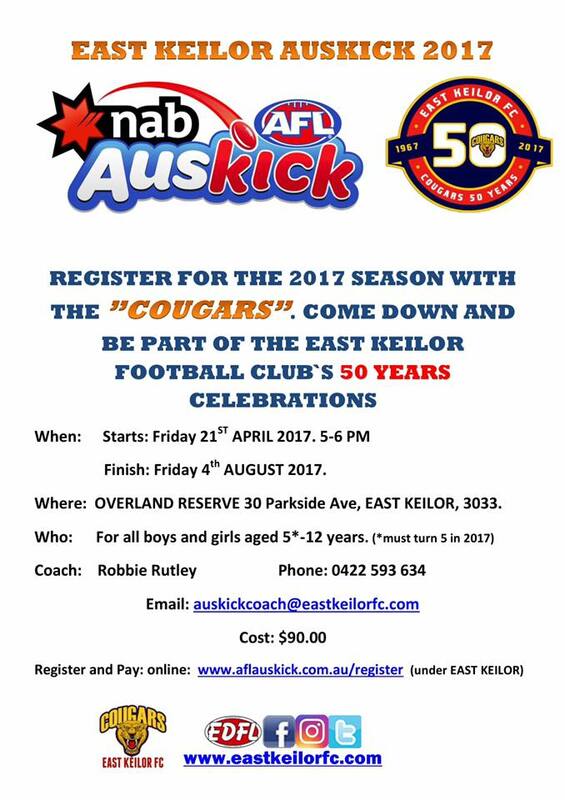 It will be a ripper with plenty of entertainment and the naming of the 50 year Golden Jubilee Senior team. 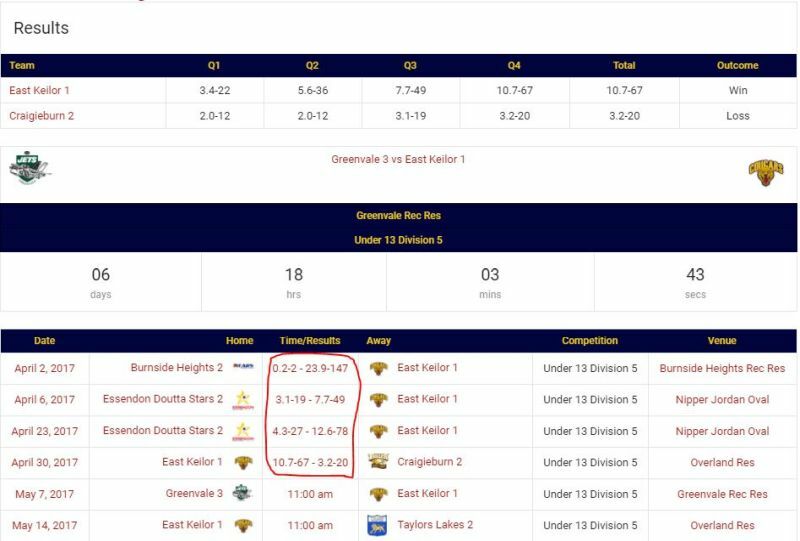 By round 4, Saturday 29th April, the Cougars will have had one match away, one bye and Easter holidays. 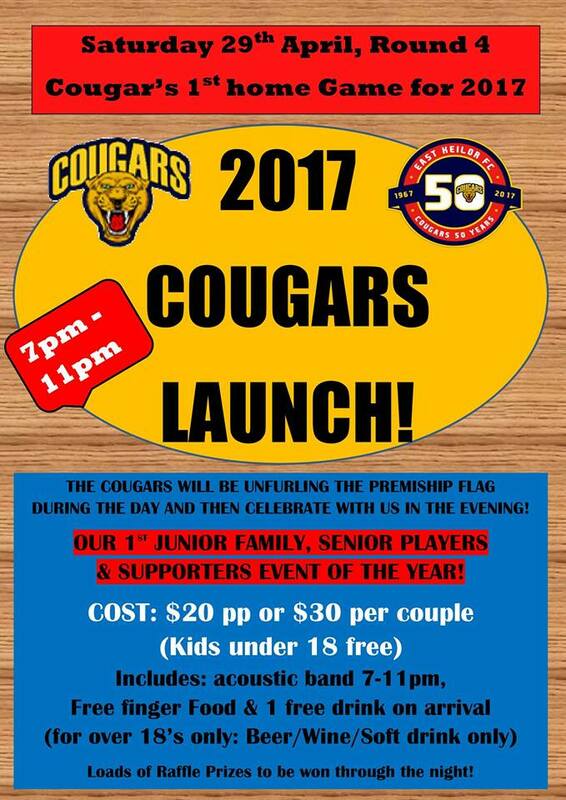 So now it’s finally time to unfurl our premiership flag and host our first home match for the season! Let’s do it with a bang! Inviting everyone to come to our 1st home game! Stay for our special launch night! Acoustic band from 7-11pm, loads of raffle prizes, free finger food, free drink on entry (for over 18’s ~beer/wine/soft drink only). Cost: $20per person, $30 per double. (Kids under 18 free)~ Or maybe arrange a baby sitter for the night! It’s a great chance to meet our senior players and coaches and for them to meet our juniors parents and friends that help support this club in so many ways!